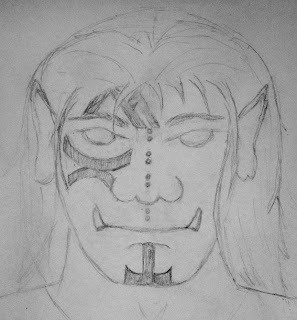 Good To Begin Well, Better To End Well: Orc Romance Sketch Party! Okay, not really. But the other night my fingers itched so I sat down and gave sketching Bolthorn a shot! Those of you who know me might know that I am notoriously unable to envision faces, but it came out not so bad, if I do say so myself. In my wip, BLOOD OF THE KING, the Hrimthursar are a clan of orcs who live on the coldest of the northern mountains which divide the human lands from those which belong to the elves and the dragons. Bolthorn is Gothi (chief/leader/first speaker) of the Hrimthursar. I'm not entirely happy with the tattoos -- they should be a lot more complex than they are in this sketch -- but I didn't want to ruin the sketch mucking about with them any further. Generally, the tattoos on the forehead mark the clan, and then on the cheek and chin is the family/bloodline/occupation information. Hrimthursar are always tattooed on the right side of their face, Vidthursar are tattooed on the left. Bolthorn has another set of tattoos which climb from his left shoulder blade over his shoulder and down across his breast to his heart, which mark him as Gothi. There are also two tattoos which indicate marriage, and those are placed over the pulse of the throat and the inside of the left wrist. 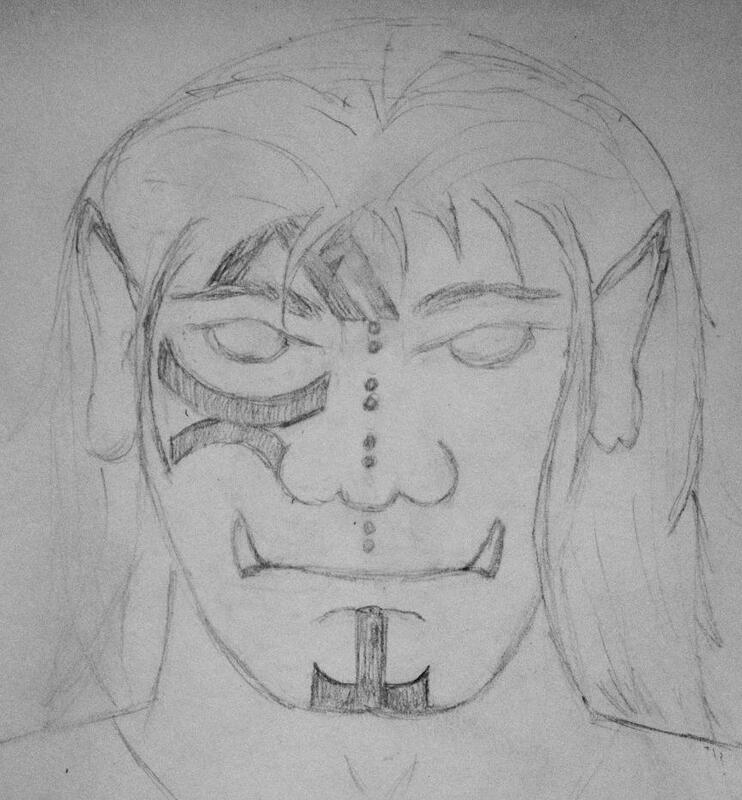 And now that you know more than you ever needed to know about how orc tattoos work in my manuscript, I'm sure you're really thrilled that I'm back to blogging! ha. Needless to say, the move went very well and we are in the process of settling in still. So! Tuesday I have a guest post to offer you from the fabulous Diana Paz, in the category of AFFAIRS OF THE GODS! I hope you'll enjoy it! Very interesting! There's a lot more to tattoos than I would have imagined. Silly us- just using a ring to show marriage status.